League City, Texas: Our Hotel's Lovely Home. 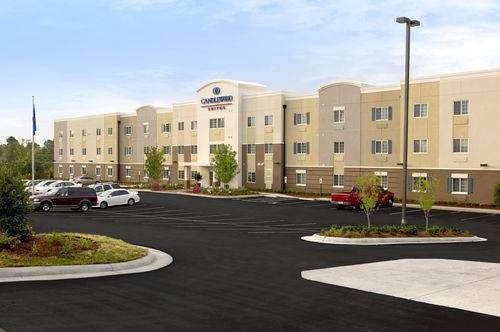 The Candlewood Suites League City hotel has access to many popular businesses and attractions. A central location makes us one of the most convenient hotels in League City, and we're a short drive or walk from many parks, shops and restaurants. You can bring the whole family on vacation because we're pet friendly! This hotel's warm Texas hospitality makes your trip enjoyable while you spend your days relaxing on the nearby beaches or riding at the Bay Area Raceway. Get a glimpse of distant planets at the Johnson Space Center less than five miles away, or stay grounded at Kemah Boardwalk, a local landmark with rides and shops. For guests joining us on business, we are close to ExxonMobil, UTMB Medical Center and the Johnson Space Center. The Business Center has a computer and printer to help you communicate with clients, and there's free Wi-Fi access throughout our pet friendly hotel's property. While in Texas for an extended vacation, a contract or relocation, stay with the brand that understands what long-term travelers need. You can pack light thanks to free guest laundry facilities, but if you forget something or need a value-priced meal, head down to the Candlewood Cupboard convenience store. You can also enjoy the relaxed environment by visiting the outdoor pool, gazebo and grilling area. The Candlewood Suites League City, Texas hotel's staff invites you to "Consider Us Home." South Shore Harbor Country ClubThe 9-hole "Harbour" course at the Canongate of South Shore facility in League City, Texas features 3,364 yards of golf from the longest tees for a par of 36 . Designed by Dave Marr/Jay Riviere, the Harbour golf course opened in 1992. Magnolia Creek Golf Course3 public golf courses, 27-holes. Ireland Course: Designed by Tom Clark. Built in 2000. Season: Open all year. Scotland Course: Designed by Tom Clark. Built in 2000. Season: Open all year. England Course: Designed by Tom Clark. Built in 2001.